Only five of the NHL's 16 playoff spots have been clinched entering play Monday, but Tampa Bay has already locked up the Presidents' Trophy (given to the team with the league's best record) with six games remaining, so the 'Ning have gone way OVER their preseason points total. Only five of the NHL's 16 playoff spots [have been clinched](https://www.thescore.com/nhl/standings) entering play Monday, but Tampa Bay has already locked up the Presidents' Trophy (given to the team with the league's best record) with six games remaining, so the 'Ning have gone way OVER their preseason points total. It's been a remarkable season for the Lightning (58-14-4), who are already tied for [the eighth-most points](https://records.nhl.com/records/team-records/standings-points/team-most-points-one-season) in a season in NHL history with 120. Tampa Bay, which [is +225 to win its second Stanley Cup](https://www.betchicago.com/blackhawks-futures-odds-nearing-playoff-elimination) (2004) and EVEN money to win the East, had its seven-game winning streak snapped Sunday with a 4-3 loss in St. Louis. Still, the Lightning has 19 points more than the next closest teams -- Boston and Calgary. 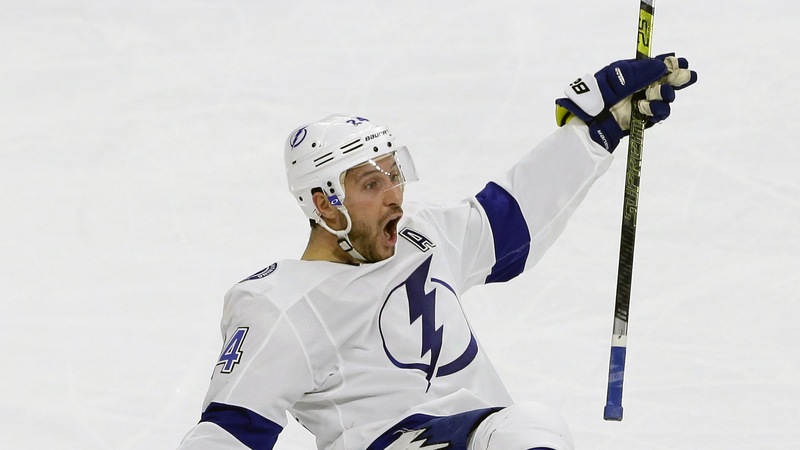 Tampa Bay is led by Nikita Kucherov, who has [a league-leading 120 points](http://www.nhl.com/stats/player?reportType=season&seasonFrom=20182019&seasonTo=20182019&gameType=2&filter=gamesPlayed,gte,1&sort=points,goals,gamesPlayed), and Brayden Point (90) and Steven Stamkos (89), who are both in the top-10. The Lightning finished with 113 points last season (most in the East) before losing to the Capitals in seven games in the conference final. Four teams in addition to Tampa Bay -- the Flames, Islanders, Hurricanes and Canadiens -- have gone OVER their preseason win total at the Westgate SuperBook, while the Predators, Flyers, Wild, Panthers and Oilers have joined the Ducks, Devils and Kings in the UNDER club. The Blackhawks, who had a preseason points total of 84.5, have 76 points as of Monday with seven games left. With the regular season ending in less than two weeks, let's take a look at where all 31 teams currently stand. We'll break them into seven categories -- already OVER, only a matter of time to go OVER, likely OVER, 50/50, likely UNDER, only a matter of time to go UNDER and already UNDER -- based on their point totals entering play Monday. __MORE:__ [Blackhawks futures plummet as they near playoff elimination](https://www.betchicago.com/blackhawks-futures-odds-nearing-playoff-elimination) ## 2018-19 NHL season points total *totals entering play Monday; teams are listed within each section in order of their current points __Already OVER__ Lightning (120), preseason win total: 107.5 Flames (101), total: 93.5 Islanders (95), total: 83.5 Hurricanes (91), total: 84.5 Canadiens (88), total: 80.5 __Only a matter of time to go OVER__ Bruins (101), total: 102.5; games remaining: 7 *will go OVER with next win Capitals (96), total: 98.5; games remaining: 6 Sharks (95), total: 97.5; games remaining: 7 Coyotes (79), total: 80.5; games remaining: 6 *will go OVER with next win Canucks (74), total: 77.5; games remaining: 6 __Likely OVER__ Golden Knights (90), total: 96.5; games remaining: 7 Rangers (71), total: 75.5; games remaining: 8 __50/50__ Blues (88), total: 95.5; games remaining: 7 Blackhawks (76), total: 84.5; games remaining: 7 Sabres (71), total: 79.5; games remaining: 8 __Likely UNDER__ Maple Leafs (94), total: 106.5; games remaining: 7 Blue Jackets (86), total: 97.5; games remaining: 7 Red Wings (64), total: 75.5; games remaining: 7 __Only a matter of time to go UNDER__ Jets (94), total: 106.5; games remaining: 7 Penguins (93), total: 103.5; games remaining: 6 Stars (82), total: 94.5; games remaining: 7 *will go UNDER with next loss Avalanche (81), total: 90.5; games remaining: 6 Senators (58), total: 71.5; games remaining: 7 *will go UNDER with next loss __Already UNDER__ Predators (90), total: 105.5 Flyers (80), total: 98.5 Wild (79), total: 95.5 Panthers (78), total: 94.5 Oilers (74), total: 91.5 Ducks (72), total: 96.5 Devils (65), total: 91.5 Kings (62), total: 93.5 __PLAY:__ Our [free Chicago NHL Puck Drop](https://betchicago.chalkline.com/games/chicago-nhl-puck-drop) game for the chance to win a BetChicago prize pack. All you have to do is correctly pick the score of Tuesday's Blackhawks at Coyotes game to win.